It turns out that I've taken a number of pictures of Fort Benton bronze, so here's one more for today. 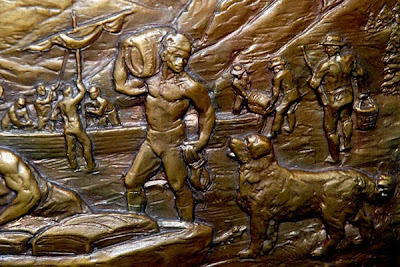 This is a detail of a larger piece depicting Lewis & Clark's portage of the Great Falls of the Missouri ... and the handsome quadruped on the right is of course Seaman the Newfoundland. A quick web search failed to reveal the name of either the artist or the work, but I'll keep looking.